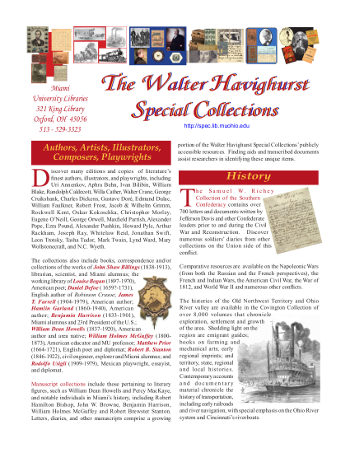 Established in 1970, the Walter Havighurst Special Collections is named for Walter Havighurst, a writer and professor of English who taught at Miami University from 1928 to 1969. Helen Ball was its first curator. Today, the Walter Havighurst Special Collections in King Library houses more than 95,000 volumes plus manuscripts and archives, and continues to grow according to the collection development policy (pdf). Cataloged volumes are included in the Miami University Libraries’ online catalog at http://www.lib.miamioh.edu which may be searched directly from the Special Collections homepage. More information about the collections, as well as finding aids for selected manuscript collections and archives. Located on the third floor of King Library, the Walter Havighurst Special Collections invites researchers to enjoy its reading rooms and an exhibit gallery.